While a picture can speak a thousand words, looking at this snapshot I’m drawn to focus on everything that isn’t stated or shown. Simon, while appearing frail, doesn’t show how small he truly is. His hand is no bigger than my thumb nail with each finger barely equaling the circumference of the ink cartridge of a ball point pen. Simon is tiny. A perfect little body packed into twelve inches (literally) of space. This photograph doesn’t show all the hours of work, dedication and perseverance that everyone supporting Simon has and will continue to put forth. While this picture says much, what it doesn’t say is even greater. Today was necessary. I awoke and called to get a status update from the NICU and then began the day with a doctors appointment and much needed family time. We have spent the day without rushing about to accomplish the ever-growing list of must-dos. Instead we have talked, played and cooked. Rob joined in with some cleaning too. We, as a family, desperately needed the opportunity to reflect, relax and regroup. The next months are going to be difficult for all of us and days like today will be pertinent to our strength and survival. Now for the updates that one couldn’t wait to read! Strength. The bond between mother and child is amazing. There’s a positive flow of encouragement through difficult times, tears shed over many events and most of all a never-ending supply of strength. Today showed us just how important strength is through our own situation. Yesterday Simon went through a five-hour procedure that was vital to his survival. He received a PIKK line that will be used to supply nutrient rich liquids into his tiny body. The stress of the procedure was felt through the night with a few ups and downs in his stats. By this morning, however, he was back on the mend and doing well by all mechanical accounts. Between the hours of eight and ten, it was decided by the Neonatologist to remove the ventilator. The next step in the series is a CPAP which promotes positive air pressure. 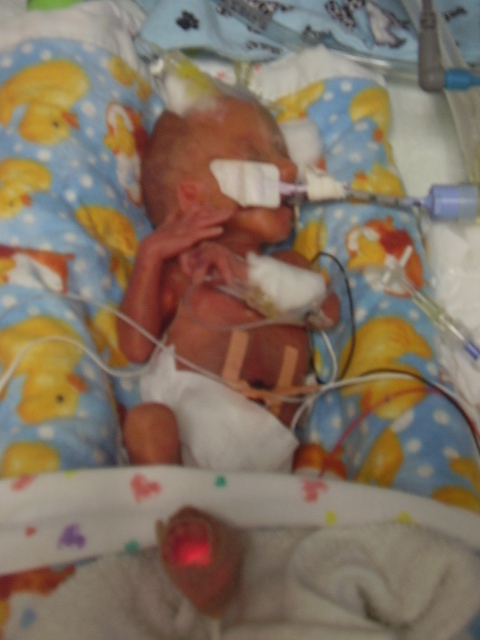 Out came the tubes that supplied a few days for Simon’s lungs to grow in strength and on went the CPAP mask. He took his first breath all of his own accords today. While the CPAP provides positive airway pressure, it doesn’t make his lungs work. He had to make that choice himself. He did. The amount of oxygen he’s received has varied through the day, but for the later half he has been around 29% oxygen. After yesterday’s procedure, Simon lost a bit of blood. His red blood cell count was down today and received his second transfusion of blood. He’s done so much better since receiving that. We can’t be more thankful to the donor who offered a bit of himself. All in all, it’s been a day of strength. Strength for the family as well as for Simon. It takes every ounce of energy I have to not jump in the car and make the drive there. I miss seeing Simon, even if through an isolette most of the time. This blog is being converted over so that I can share with you daily updates, events and life for Simon Gabriel, born too soon. It’s been a long journey thus far and an even longer journey ahead. While it’s important that we share our experiences with a twenty-four-week preemie, we also want to share our struggles in balancing home with commuting. Our four-year-old son is having his own challenges with the situation. We will share those obstacles here, too. The situation was challenging while I was on bed rest prior to Simon’s birth, but has taken on a degree of difficulty that we never would have imagined. Commuting back and forth will pose many challenges for all of us here. We will work out a calendar that should allow for me to spend half the week in Denver, CO with Simon and half the week here with Jaden. Maintaining the balance is crucial for both of our children. So while this blog is dedicated to Simon, we will not forget the whole picture and all that is occurring within our little family. We thank you all for stopping by and sharing in our journey. I arrived home last night. My bug definitely needs some special time with Mom. It’s a long road and It’s REALLY hard. 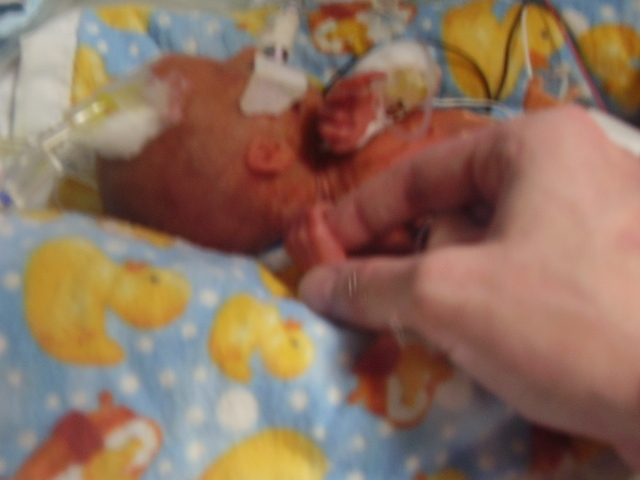 We of course went into the NICU and said our so-longs and we would be backs to Simon before leaving. He had an extremely long day yesterday. He underwent a five, yes 5, HOUR proceedure so they could get a pik line in him. He did really well through it though. Very nerve wracking for Rob and I both. They let Simon sleep through the night and just did his cares without adjusting any of his ventilator settings. They wanted to give him the night to rest and relax. He’s doing good this morning. I’ve already (less than 10 minutes from waking) have talked to his nurse. They are still going back and forth on removing the ventilator because it’s so hard to maintain a cpap on a guy as little as Simon. His weight is down to 1 pound 2 ounces, which will continue to fluctuate until they are able to start feeding him more via pik line and eventually NG tube. My day today is going to consist of spending MUCH time on the phone. There are many things that need to be wrapped up and other plans we need to get into motion. Jaden was thrilled that Mom came home last night. He REALLY needs this time with me and hopefully I’ll be able to prepare him to some extent about my traveling back and forth to Denver. It’s a two hour drive on a good day for us, but can take much longer too. That’s it for now. I’ll update again when I can. It’s been a stressful, challenging and amazing day all wrapped into one. Never in my wildest dreams would I have pictured myself watching such an amazing resemblance of a perfect human in tiniest form grow and change right before my eyes when in reality he should still be nestled midst amniotic fluid, safe inside. Simon is definitely a trooper. Many things have changed since this morning. Some definitely for the better while others have been a bit more challenging. We’ll start with the rough stuff first. Simon had to have his first intake of someone else’s blood today. His red blood cells were low. This came following the glucose spike. It happens with preemies and we know that we’ll see more of this in the future days to come. His chest x-rays looked good. His lungs look “on target” and are “functioning well.” Surprisingly, he was on 21% oxygen today which is equivalent to room air. He spent a few hours at that rate and they turned down the ventilator a notch. That bumped him up to 30% oxygen and they will work their way down from there. He is on medication to help with his blood pressure. It’s going to take a bit of time for the medication to work on closing his heart, at least at this point. We are awaiting the results of the echo cardiogram to let us know if it is closing or not. If not, he could be facing surgery to close it up. Something that is common in preemies. One of the most exciting events of the day is that I was able to touch my son for the first time since his birth. I was in while they were flushing his IV’s, changing his diaper, drawing labs and the like. While that was taking place I sat and rubbed his little foot and talked to him about how much we loved him and wanted him to be the strongest little boy possible. The nurse was thrilled to see that while all the disruptions were occurring, his blood pressure regulated and heart rate stayed steady. That’s definitely a step in the right direction – and all it took was a little comforting from Mom. Rob’s parents came and brought Jaden with them. Jaden had a rough time not being able to see Simon today. He’s struggling with understanding that his brother is too little for him to touch at this point and we can’t risk Simon getting any sort of infection that Jaden might carry. I don’t think Jaden will be here again in the near future because of that. As long as he can understand that his brother is “sick” I think we’ll be okay on that front. Simon was baptized today too! The hospital chaplain was more than willing to perform the duty. We are thrilled that we had the opportunity, especially at such a young age. It’s comforting in its own way. Now for me, I’m officially 24 hours post delivery. I’ve spent half the day without an IV pole at my side and have been able to freely roam around. I’ve enjoyed having the opportunities to get up and about, especially after the last couple of months. I’m still extremely tender and expect that will be the case, at least for another week or so. Hopefully tomorrow won’t be too bad, pain wise. Seems sometimes day two is worse than day one. I’m also quite exhausted. I still intend on heading to the NICU one more time before the night is over and hopefully will have my vitals taken at 10:30 so I can go fast asleep and not be disturbed for another four hours. That would be the ideal situation, that’s for sure!! That’s it for now. I will update again tomorrow, possibly with more pictures to share. I have pictures of Simon. I took them with my cell phone at 1 this morning while in the NICU with him. He’s doing well. They gave him surfectant to stimulate his lungs while in the delivery room. He is on a ventilator but is on room air (21%), has managed to keep his blood pressure regulated, though barely. Simon had a glucose spike this morning, so they have changed his fluids to reduce the amount of sugars he’s receiving. They have lines in his umbilical cord for feeding and lab draws so they won’t poke his skin, blood pressure cuff on one leg and o2 stats on one arm. They did have a line in his scalp, but are going to try for a more permanent line in his arm today instead. He was exactly 655 grams or 1 lb, 7 oz. That’s extremely good for a baby of his age. His weight is considered high end of normal. He was also 30 cm or 12 inches. I’m sure I’ll think of more that was discussed… oh yeah, he is on antibiotics to fight off infection and was given meds to close the hole in the heart that all babies have this early. This is generic, so forgive me – I asked for my laptop to at least update everyone quickly before I’m able to sleep. hi everyone. It’s been a really long day. Simon is here. He was born at 8:42 pm and weighs 1 pound 7 ounces, roughly. He is in what they call the honeymoon period. I’m doing okay, considering. The pain from the incision and the infection are making for quite the discomfort, but we are okay. I am having a hard time believing I’m no longer pregnant. It’s really hard to believe. But, that’s it for now. I’m tired, extremely tired. I did want to update though. Thank you all for prayers! !